Skype 2.0 for iPhone has been released. You can now call using your 3G connection. Skype-to-Skype calls on 3G are free until the end of 2010, after which there will be a small monthly fee (operator charges for data will still apply). Skype for iPhone version 2.0.0 also comes with Near CD-quality sound for Skype-to-Skype calls using wideband audio (SILK codec) on iPhone 3GS, iPad and 2nd & 3rd generation iPod touch, enhanced call quality indicator, improved start-up time, fast access to the dial pad from iPhone home screen. Skype 2.0 for iPhone is available for download FREE on the App Store in the Social Networking category. 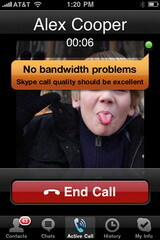 0 comments on "Skype 2.0 for iPhone adds VoIP over 3G"